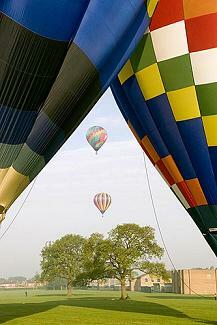 We are one of the many clubs in the UK affiliated to the British Balloon and Airship Club. We are an active club, hosting around 10 balloon meets each year (on average, one a month February to November) and we have members from all over the UK. You can follow us on a variety of platforms, we can be found on; Facebook and also track us on Twitter too. We use WhatsApp to keep everyone up to date when we are at our meets. Please feel free to have a good old wander through the website to find information on ballooning in general, bits of news, information on our balloon meets, how to get in touch with us, how to join our club (everyone is welcome by the way, balloon or no balloon), and various other bits and pieces. Our region is located to east of the Pennines, from Northumberland through the north east counties to Yorkshire and down into North Lincolnshire. There are a number of National Parks in the region, Sites of Scientific Interest (SSSI), plus several Areas of Outstanding Natural Beauty (AONB), added to these, we also have lots of market towns, pretty villages, and historic cities. How lucky are we? We get to fly over them! We welcome anyone with an interest in hot air ballooning - whether you are an existing pilot, experienced crew, possibly thinking of training as a balloon pilot or crew, or just wish to get a bit closer to take a look at our large and colourful aircraft. We are a friendly bunch, and we welcome anyone to come along, say hello, and join in. Why not come and see us at one of our meets? All we ask is that you contact us first, so we can arrange to welcome you in person and advise you if there's been a change of plan. Ballooning is weather-dependent and we'd rather you didn't have the disappointment of a wasted journey. New members are very welcome! - Please JOIN HERE!